It’s the bead that built itself. This simple technique, when repeated in layers and with small variations quickly results in a multiplicity of complicated and beautiful textured shapes. 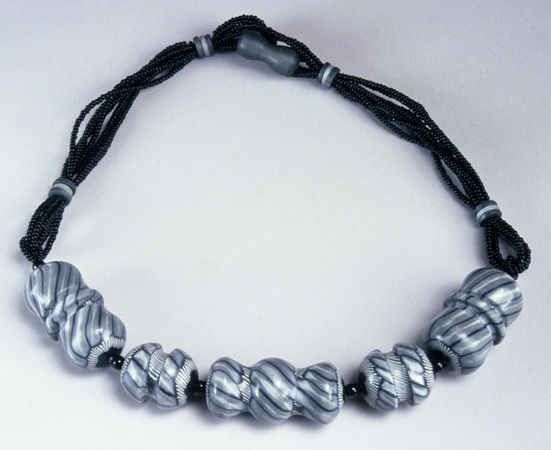 You can turn these forms into beads as you go, use them as models for molding silver clay, polymer, or other materials, or just use them as tools as you play with the endless variety of forms that flow forth. We will start by creating and transforming texture sheets using polymer clay, carving and sculpture tools, and latex rubber. You will learn how to makes smoothly domed forms in any shape. Then, using my latest techniques, you will transform the textures you have created into dramatic and deeply textured three dimensional forms. Starting small and progressing towards larger shapes, you will learn how to use the shapes you create to modify each other and how to evolve them using sculpture techniques. This technique is a great low pressure way to just play with clay and get your creativity flowing. 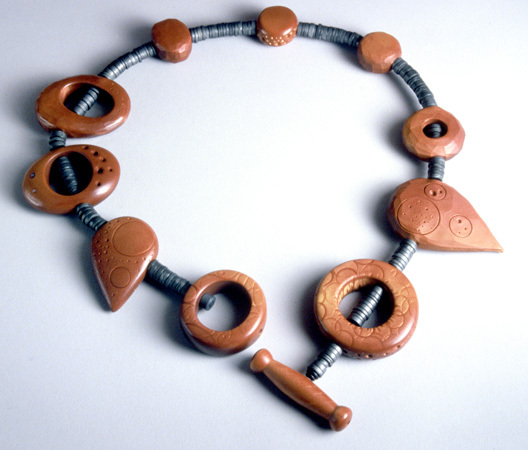 Because we will start by out making tools using scrap clay you don’t have to be concerned about whether or not you are in the process of creating a special piece of jewelry. You will learn to move quickly and get into the flow of the process. After we get warmed up we will add color and begin transforming our work into beautiful beads (these shapes are great for pins too!). Finally, take your favorite pieces and re-create them in fine silver using silver clay. 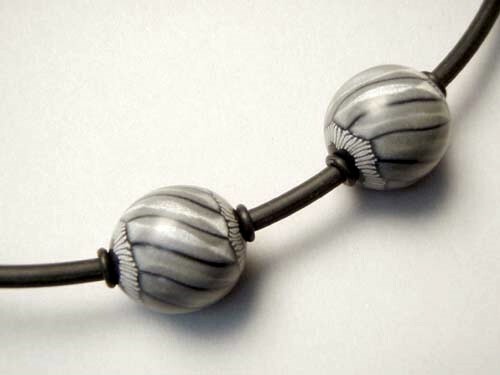 You can even add color and pattern to your silver piece using polymer clay. It’s a cross between die forming, mold making, sculptural techniques and alchemy and it’s the most fun you will ever have. Two day version: Learn how to do everything but the silver clay Three day version: Create incredible forms and recreate them in silver. Seed pod or sea urchin? That is the question. This technique can produce beads that look like they popped right out of…well, somewhere natural. Learn to make fabulous organic textures that wrap seamlessly around beads and leave little evidence of the method of their creation. You will marvel at what you can create with this technique. 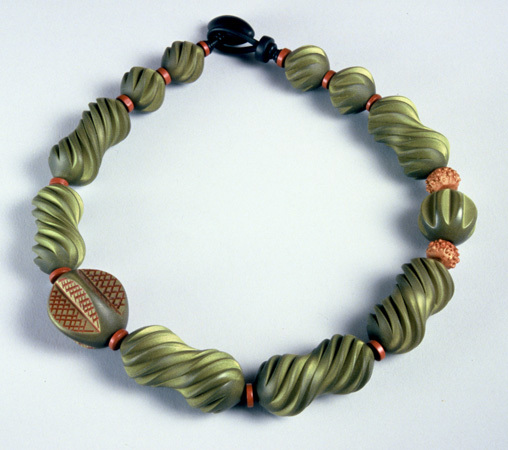 First, you will learn to turn raw and cured polymer clay on a lathe. 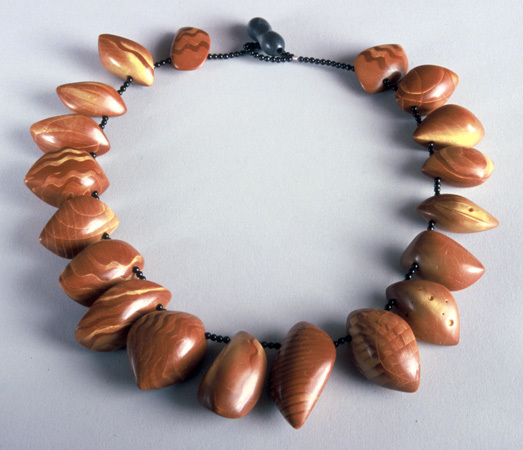 Create symmetrical beads wrapped in ribbons, bands, and sensuous curves. Lathe turning can be done with a simple electric drill or a fancy woodturning lathe. 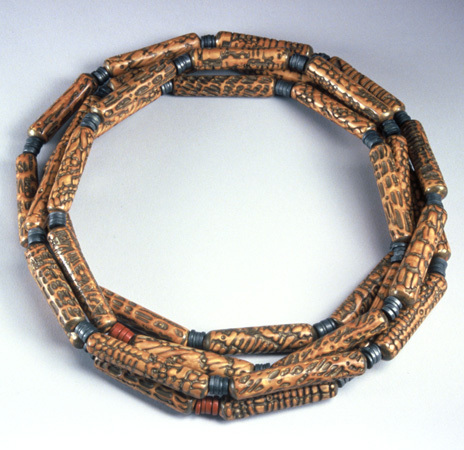 Either way, it opens new frontiers in forming, patterning, and finishing polymer clay. Next, you will learn techniques for creating texture tools with polymer clay and common items that are probably lying within your reach as you read this. 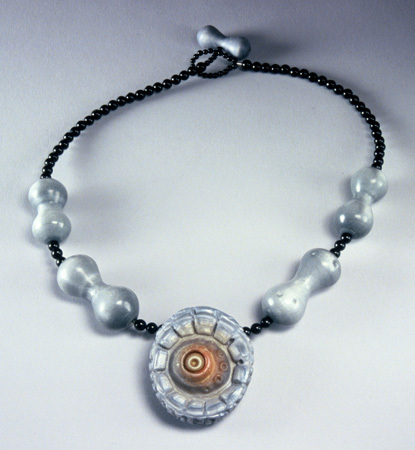 You will learn to transfer this texture to cylindrical, spherical, and disc shaped beads leaving nary a fingerprint, and without distorting the form of the bead. But there’s more. 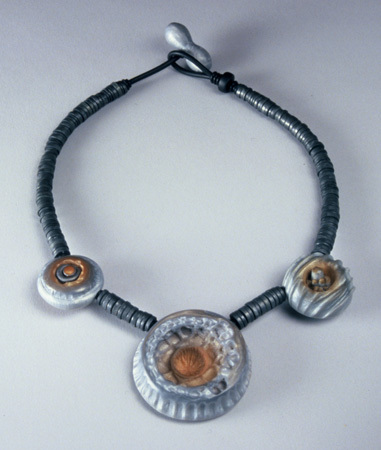 Take your clay art to the next level by creating a textured silver clay end cap, embedding it in your textured polymer bead, and finishing it all off with a hand hammered sterling silver tube rivet. We will explore the possibilities opened up by multi-stage curing. We will delve into color and pattern within the clay as well as surface treatments. Lastly, we will cover finishing by sanding and buffing. You thought sanding and buffing was laborious? With a lathe, all you do is hold the sandpaper and the beads sand themselves. 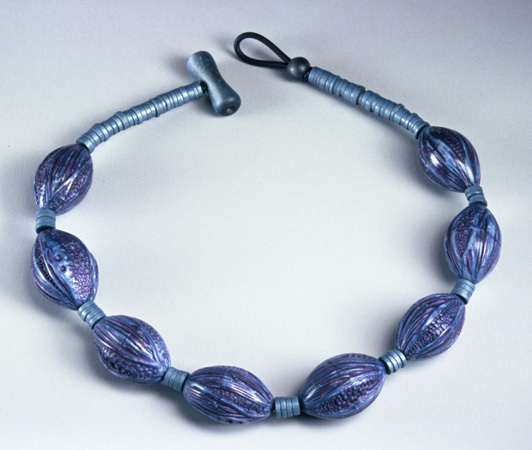 Students will leave this class with finished beads, beads in progress, and more ideas than they know what to do with. 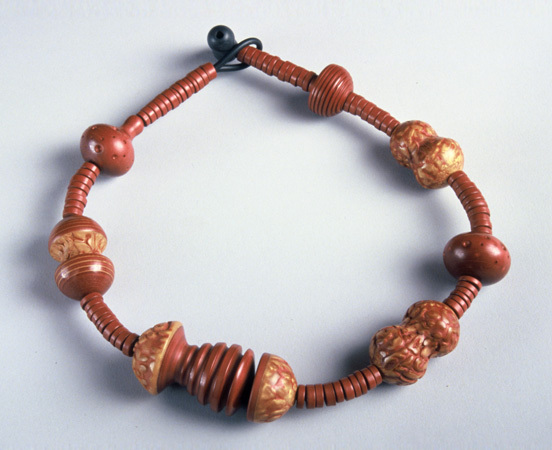 One day version: Learn either lathe turned or textured beads. Two day version: Learn both lathe turning and textured beads Three day version: Learn lathe turning, textured beads, and riveted silver clay end caps. Mica is the magic in these shimmering seductive beads. 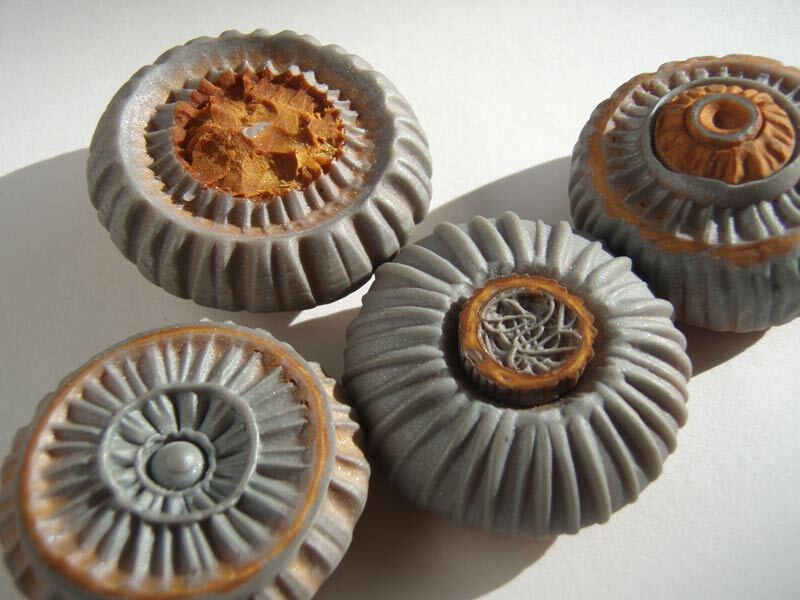 Learn to create and manipulate the chatoyance, or “cat’s eye” effect possible with this clay. Make shifting variations of shade within any given color of clay and illusions of depth on a smooth surface. This class will focus on how to organize the mica, and how to bend it to create luminous patterns of holographic depth. You will carve, hand-manipulate, texture, backfill, and then sand and buff beads for a mesmerizing, lustrous, soft and supple finish. Learn to make patterned canes from colored polymer clay and then cut them into beads on a lathe. Remember the wonder when you first discovered millefiore canework? Be prepared to experience it anew as you reveal intricate, symmetrical, and ever-changing patterns hidden not just in the ends, but in the sides of even the simplest canes. 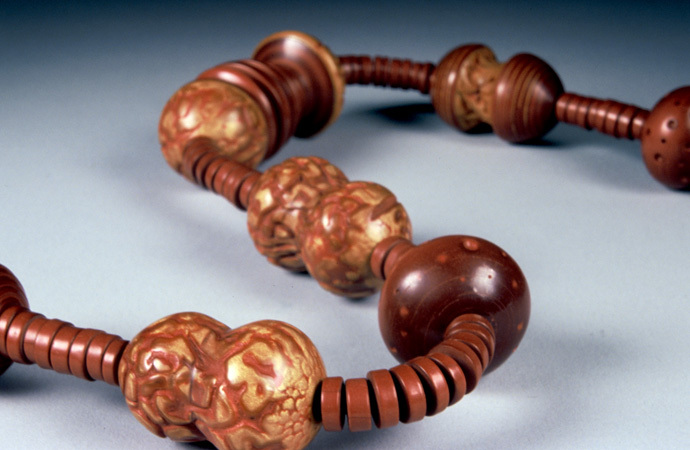 Lathe turning will take your millefiore beads to a whole new level. It’s extrusion and lathe turning, two great techniques that look great together. 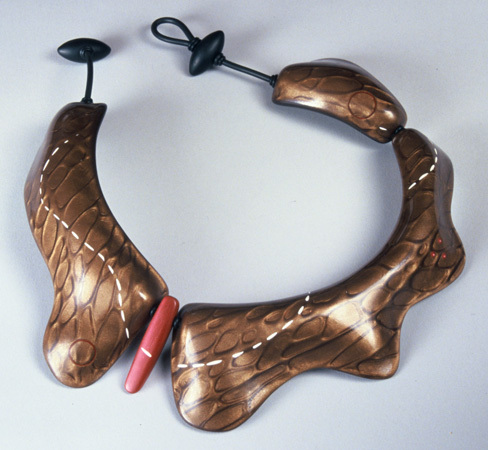 Extrude shaped tubes of clay with fins and forms cut along their lengths, twist, stretch and cure them, then cut them into bead shapes on the lathe. It’s easier than it sounds and the results will blow you away. These elegant forms are enlivened by the luminescence of pearlized mica clay and are a fantastic focal point for fabulous jewelry. 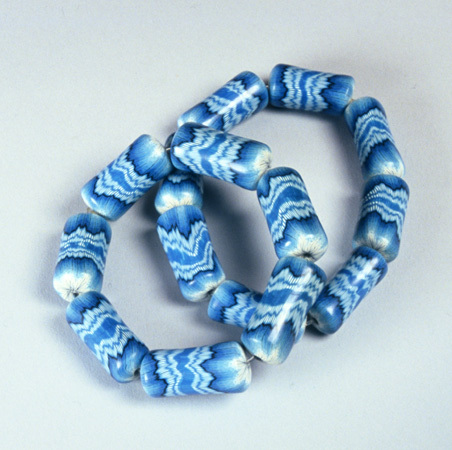 Twenty different beadmaking techniques and thirteen incredible pieces of jewelry. Information and inspiration like you’ve never seen before, and all in one place. Learn my latest techniques for lathe turned and textured beads, mica beads, recursive beads, mandrel formed beads, hollow form beads and more. 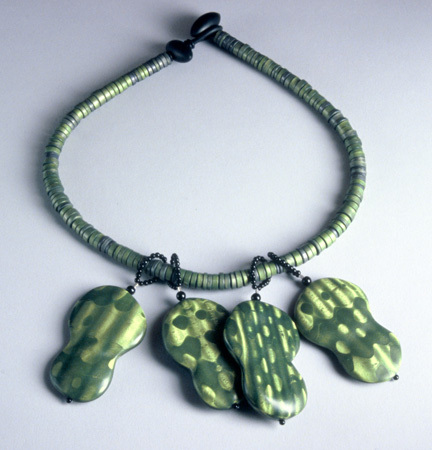 All accompanied by a gallery of the worlds top polymer artists. This is a must have book for anyone interested in polymer clay, beads, or art jewelry. You’ll want one for your coffee table and one for your studio. This DVD, released in 2005, features almost four hours of tightly edited instructional footage. Learn how to create incredible shimmering surface effects with polymer clay. 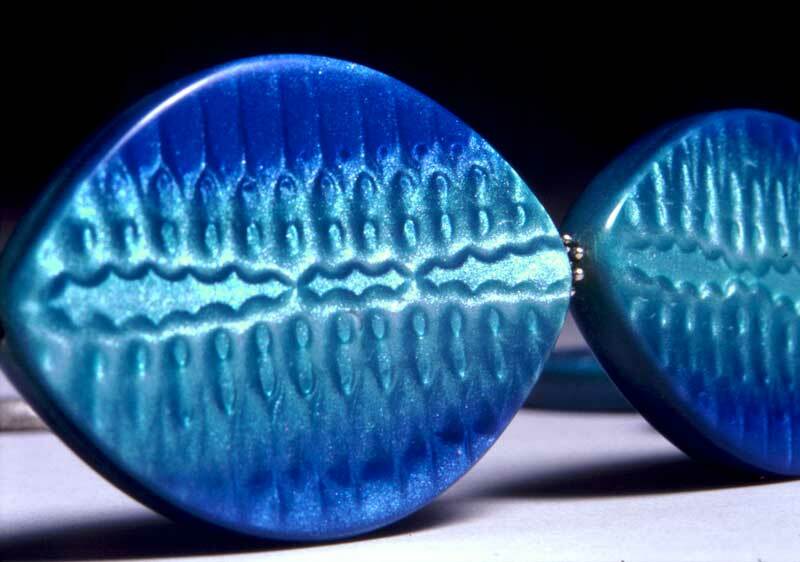 Find out about “mica clay,” or pearlized polymer clay that contains mica particles, and how to use it to make patterns of holographic depth. This video will teach you how to initially organize the clay into sheets, then stacks or “ingots.” Learn multiple ways of reorganizing the ingots and using them to create “ghost image” effects, as well as other patterning techniques. 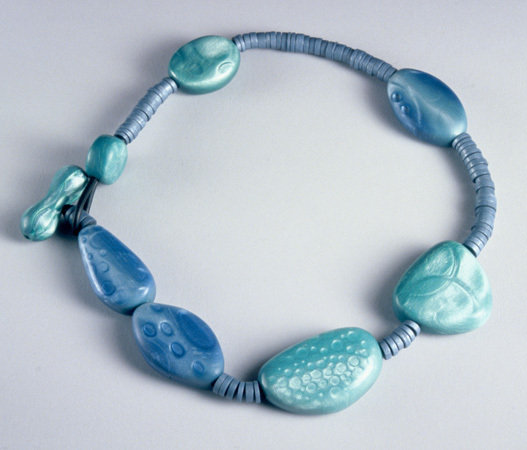 The video is packed with tips and techniques for beads, jewelry and larger 3D forms. Includes sections on texture, color mixing, and finishing by sanding and buffing. Buy the video now from Polymer Clay Express by clicking here. Please note, this link will take you to another website. I do not process these orders.